SoftPlanet makes it possible for everyone to get free RegInOut System Utilities download directly from our servers. There is no registration needed for downloading. Many of you already know a lot of things about computers. One of them is that like your home and your car, they also need maintenance. RegInOut System Utilities 4.0.0.2 is such a tool which is capable of very quick, efficient and reliable scanning; it is an excellent analyzer and fixer of all your PC problems. This review is about the paid version of the program but you can download it for free and see it in action without any obligations. Most of the applications in this category can compete against each other based on the number of features and tools they have under their hood. RegInOut System Utilities takes a higher place in this ranking for sure. Some of its weapons against the computer's sluggishness are: Error scanner, Internet optimizer, System cleaner, Disk defragmenter, Start-up service optimizer and so on. The good news about the program is that is compatible with all Windows versions up to Windows 8. For an application whose primary function is the quality of the performed tasks, RegInOut System Utilities has a decent graphical interface. You do not have to be an expert to understand all the functions and the meaning of the tabs and the tools. Like no other, the developer's decision was to put all the possible operations in the Home tab. This way you can reach them just by a single click of your mouse. 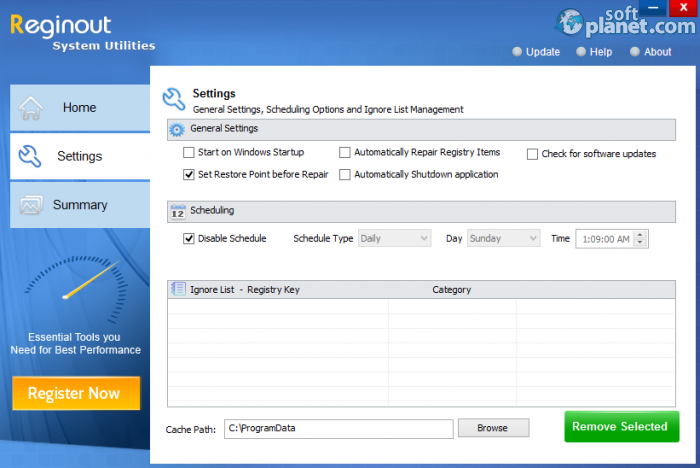 The Settings tab has three fields: General, Scheduling and Ignore list, where there are not too many and confusing features to be set. 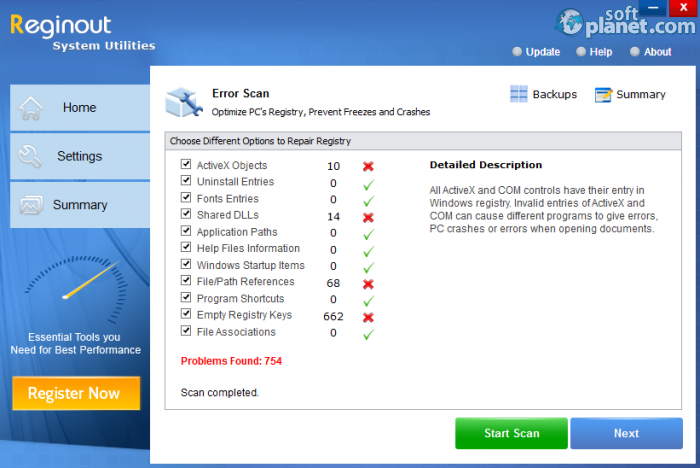 The Summary tab of RegInOut System Utilities shows summarized information about the latest performed error scans, system cleaning, computer defragmentation and system optimization. The Error Scan works this way: it has eleven optional check-boxes, each one of which can be opt-in or opt-out before the Start Scan button to be clicked. You can create a safe system backup before continuing, just in case if anything goes wrong. The results of the scan are displayed in a brief summary. Unfortunately, to see the full power of this application you have to buy a valid registration key. RegInOut System Utilities 4.0.0.2 is one very well designed software keeper and does not require from you to be a computer expert. It can do a lot of useful things in order to fix all your PC problems and bring back the real power of your computer. Try it yourself and decide later if it is the right program for you and your PC. RegInOut System Utilities is VIRUS-FREE! 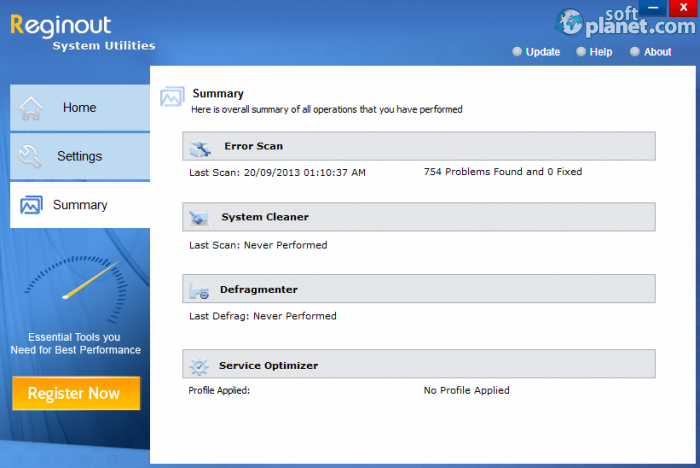 Our security scan shows that RegInOut System Utilities is clean from viruses. The current version of RegInOut System Utilities has been scanned by our system, which contains 46 different anti-virus algorithms. That ensures that RegInOut System Utilities 4.0.0.2 is 100% safe for your computer.